The Sheaffer100 Fountain Pen is sure to please. The black translucent enamel enamel finish sparkles like a jewel on a desk or in a purse and features a brushed chrome cap with satin chrome trim. This timeless finish makes a powerful statement at school or on the job. 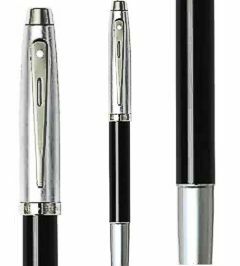 The fountain pen features the smooth writing Sheaffer stainless steel nib. 1 x G/Boxed.